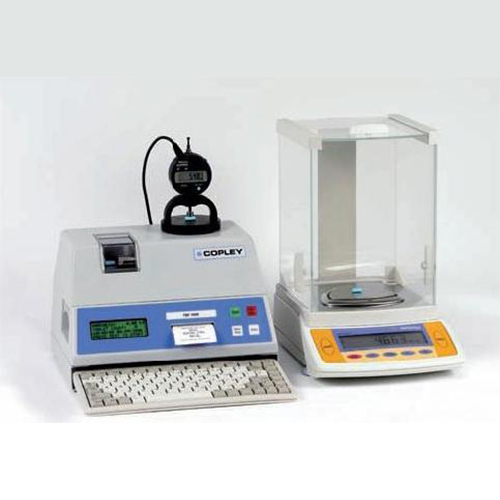 The Tablet Hardness Tester Model TBF 1000 is a complete system for measuring the hardness, diameter, weight and thickness of tablets. 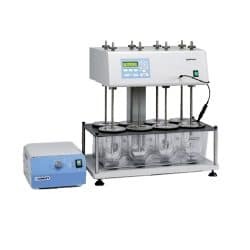 TBF 100 combines the economy of a simple easy-to-use tester with the performance and accuracy of microprocessor controlled data collection. It was designed in accordance with the specifications as laid down in Ph.Eur. Chapter 2.9.8 Resistance to crushing of tablets and USP Chapter <1217> Tablet Breaking Force. The Tablet Hardness Tester Model TBF 1000 combines the economy of a simple easy-to-use tester with the performance and accuracy of microprocessor controlled data collection. It was designed in accordance with the specifications as laid down in (EP) Ph.Eur. Chapter 2.9.8 Resistance to crushing of tablets and (USP) USPChapter <1217> Tablet Breaking Force. Foremost in the design specification were those features that you, the user, identified as being essential to the ‘ideal’ hardness tester. You told us, for example, that the unit must be as compact as possible such that it could be used in the confines of the tablet press booth. Measuring only 283 mm wide x 235 mm deep x 160 mm high (including in-built printer and optional keyboard) and weighing 8.5 kilos, the TBF 1000 has the smallest footprint of any hardness tester on the market, making it ideal for this purpose. You told us that the unit should be simple to operate – the TBF 1000 employs just three touch sensitive keys located on the front panel to setup, perform a test and provide a print-out of the results, namely <New< <Size>, <Test> and <Stats> – nothing could be more simple. At the same time, you asked for a number of advanced and sophisticated features – so, we provided them plus a small QWERTY keyboard located in the base of the instrument. Attach a balance and/or thickness gauge and the TBF 1000 will collect weight and thickness data as well. On completion of the test, the TBF 1000 automatically prints out the results and statistical analysis including time, date, min, max, mean and standard deviation together with the batch number and size. Finally, you asked us whether it would be possible to output data to an external PC or printer – so, on the back of the unit, in addition to the interfaces for balance and thickness gauge, we have provided two further ports, one RS232 and one USB, to satisfy this request. 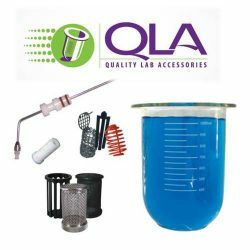 The principle of measurement is based on proven electronic load cell technology used in conjunction with a mechanical drive and electronicsignal processing. In practice, the tablet is placed on a platform between two precision ground platens (jaws), one of which is attached to the load cell and the other to a motor which provides the mechanical drive. During testing, the motorised jaw drives forward pressing the tablet against the fixed jaw until such time as the tablet fractures. Whereupon the motorised jaw retracts and the change in the resistance of the strain gauge employed on the load cell (the breaking force) is measured. The pressure to the tablet can be applied in two ways. Most modern testers including the TBF 1000 work on the principle of constant speed (that is to say, the rate of jaw movement). 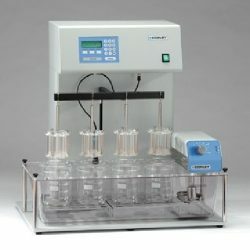 Other units, mainly earlier models, monitor the rate at which the compressive force is applied i.e., constant loading. 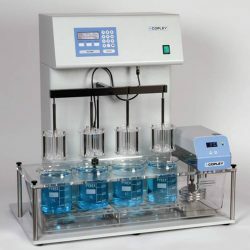 Irrespective of which method is employed, it is essential that the uniformity and rate of loading be constant in order to assure comparability of results. In general, the lower the speed or load, the more consistent the results. The US Pharmacopoeia, for example, suggests a constant platen movement of less than 3 mm per second. 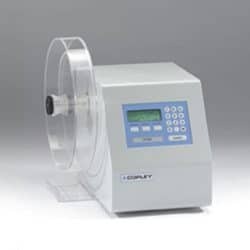 Needless to say, the TBF 1000 offers a choice of speeds between 0.06 and 0.5 mm per second with a default setting at 0.1 mm per second, all of which exceed the pharmacopoeia requirement by a considerable margin. The standard TBF 1000 has a measuring range of 0 – 520 Newtons( /- 0.1N). Other ranges, for example 50N and 1000N are availableon request – please consult our technical staff for further details. The unit will accept tablets up to 36 mm in diameter. Results can be expressed in either kilograms-force (kgf), kiloponds(kp), newtons (N) or pounds (lbs). The TBF 1000 has a throughput of approx. 5-8 tablets per minute dependent on the hardness and diameter of the tablets under test. Press the <New Size> key – the motorised jaw will retract allowing the operator to insert the new tablet between the jaws before advancing once again to press the tablet lightly against the fixed jaw. This contact is detected by the load cell electronics which in turn instructs the motorised jaw to retract to the Test position approximately 5 mm wider than that of the diameter of the tablet. The diameter of the new tablet together is printed out on the in-built printer. The unit is now ready to carry out a test. Place a tablet on the test platform, lower the guard and press <Test> twice. The moving jaw will fast forward (2 mm per second) until it reaches a position approx. 0.2 mm from the tablet and then change to the test speed (default 0.1 mm per second). The increase in load once the moving jaw reaches the tablet is displayed on the LCD display together with the tablet count, the time and date. Tablet fracture is detected automatically – once detected, the result is printed out on the printer and the moving jaw retracts back to the Test position ready for the next sample. Testing of the next sample can be initiated in two ways depending on the set-up mode (a) by pressing the <Test> key or (b) by lowering the guard. The tablet testing position is arranged for horizontal loading and incorporates a removable tray in order to dispose of any tablet debris. Ph.Eur. and USP recommend that 10 and at least 6 samples are tested respectively. At the end of the test, to initiate the print-out and re-zero the tablet count, press <Stats>. A further batch of tablets can now be tested. The TBF 1000 has been specifically designed such that all basic day-today operations can be performed using the four touch sensitive keys located on the front panel. Other obvious features like the safety guard system which prohibits operation unless closed, the tablet debris collection tray, the integral 30 column printer and keyboard drawer are, of course, included as standard. This outward simplicity disguises the many special sophisticated and advanced features available to the user via the setup menu which may be accessed through the optional keyboard. This feature is passcode protected to prevent unauthorised changes to operational settings. In the original design brief for the TBF 1000, considerable emphasis was placed on providing the user with the ability to configure the unit to their own specific needs. This emphasis is reflected in the setup menu. In addition to basic settings such as time and date, units (kgf, kp, N or lb), test speed (4, 6, 10, 16 or 30 mm/min), PC interface (RS232 or USB) and LCD backlight functions, the user can also configure the way in which the unit actually operates: the print format, the way in which the unit interfaces with other peripherals and the calibration of the instrument. 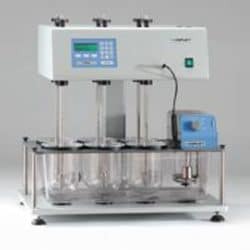 Operational settings include the ability to change the way in which batches are counted and incremented, whether a test is instigated via the <Test> key or simply closing the safety guard and the fracture detect percentage, a particularly useful feature for soft crumbly or extra hard tablets. During a test, the load cell constantly monitors the increasing force applied to the tablet. The breaking point of the tablet is said to have been reached when the force falls to a set % (the fracture detect percentage) of the maximum (peak) load reached during that particular test. The default setting for this percentage is 70% – it can however be adjusted if circumstances dictate, between 30 and 90%. Print format settings include options available to enable or disable start-up messages, the print-out of individual tablet results and diameter print-out, together with the provision to enter product names and operator identities (requires optional keyboard). 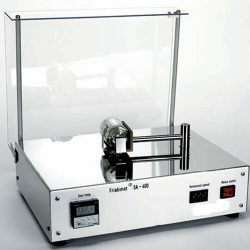 Peripheral and calibration settings allow the user to connect the hardness tester to a balance and/or a micrometer for measuring thickness and to calibrate the instrument, respectively. The TBF 1000 incorporates an automatic load check routine that runs automatically every time the unit is switched on. This routine imposes a simulated load of known proportions. The simulated load and the difference between this and the value stored at the last full calibration are displayed on the LCD. A difference of > 0.1 kg, for example, would suggest a potential problem and the need for recalibration (see below). 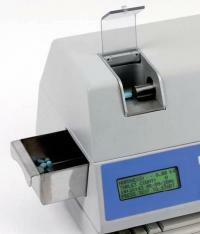 All tablet hardness testers should be calibrated on a periodic basis, for example, monthly or quarterly. Calibration on the TBF 1000 can be carried out ‘in-house’ and takes only a few minutes using the calibration rig provided for this purpose. It is based on a ‘static’ calibration technique using calibrated weights traceable to national standards. Included with each unit. 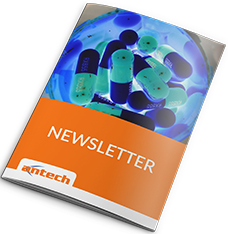 Written statement that the product, by design, complies with the current pharmacopoeia specifications. Comprehensive documentation to guide the user through the installation, operating and performance checks of the equipment, in its operating environment, using specified test protocols. It provides a comprehensive record of the suitability of the equipment to performits specified task, to be completed and archived. The versatility of the TBF 1000 does not end with the measurement of hardness – simply add a balance and/or a Mitutoyo micrometer for measuring thickness and you have a complete system for measuring the hardness, weight and thickness of tablets and similar objects with the same capabilities as many of the more sophisticated systems that are commercially available. A list of compatible balances (by make and model) may be found in thesetup menu – please consult our technical staff for further details. Weight and thickness measurements are conducted in a similar manner to that of hardness. If, for example, both weight and thickness are enabled, then at the start of the test the LCD display will show Weight – the operator should then place the tablet on the balance, wait for the weight to stabilise and then press <Test>. The weight of the tablet will now be displayed and the LCD will show Thickness to request a thickness measurement. Remove the tablet from the balance pan, place it in the micrometer and press<Test>. Repeat the exercise for hardness. At the end of the individual tests, the results relating to all three parameters are printed out.